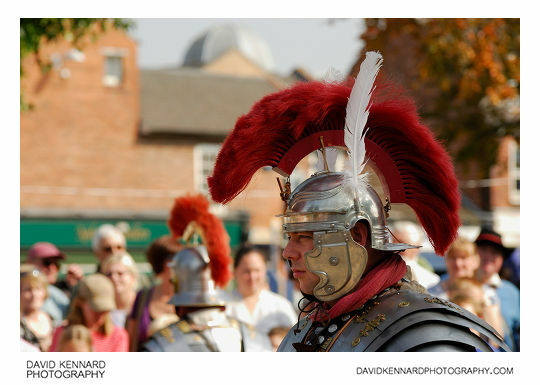 Back in September I went along to the Harborough Hoards & History Day that was held in Market Harborough's Town Square. There was a variety of educational entertainment throughout the day, though I only had time to see a couple of the events. 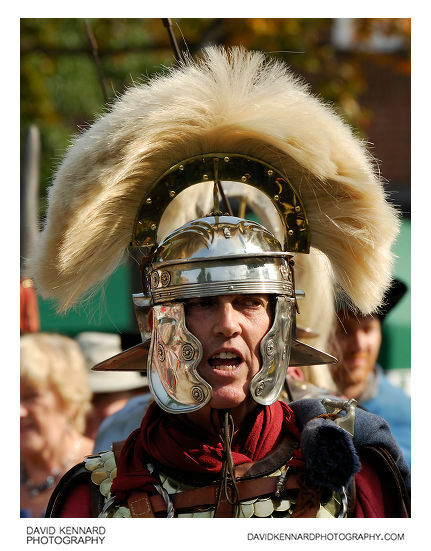 For the full programme, please see: Harborough Hoards and History Day!. 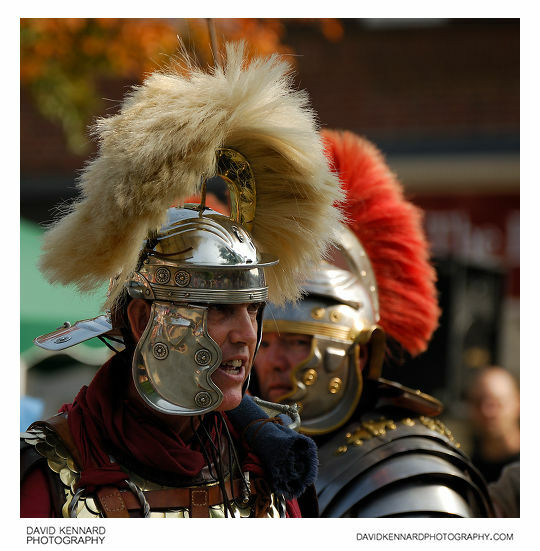 I got there just after 2.00pm, in time to see the LEG II AVG Roman Re-enactment display. 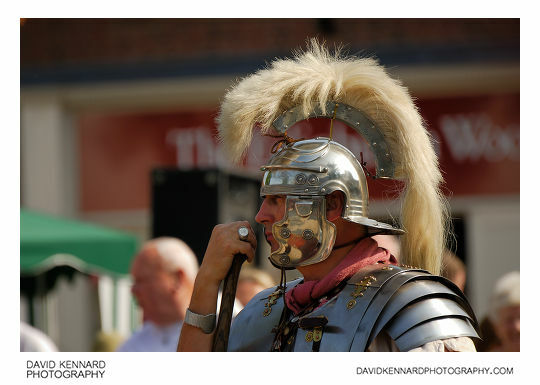 Harborough Hoards and History Day was organised to celebrate the re-opening of the Market Harborough Museum, after being closed for a year while being refurbished to hold the Hallaton Treasure. 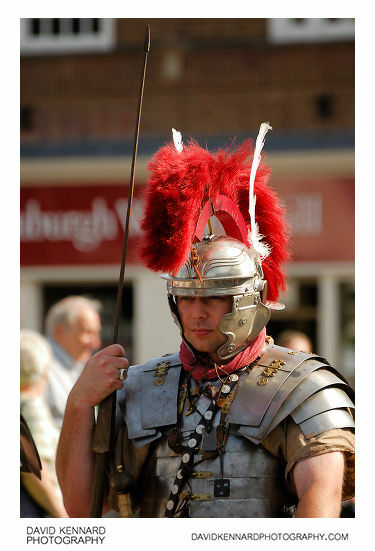 The Hallaton Treasure is a large hoard of over 5,500 silver and gold Roman coins, and a ceremonial helmet, found in 2003 in the nearby village of Hallaton. 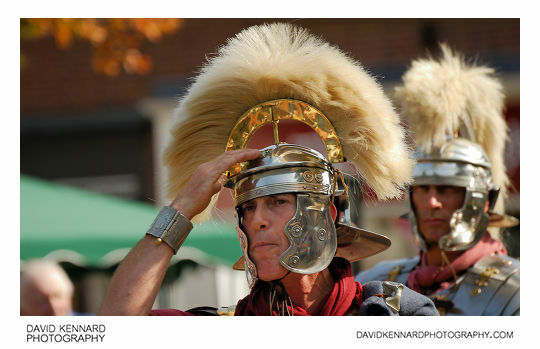 The main problem I had with taking photos of the Roman re-enactment display was that there was a few people in front of me, so I had to shoot over their shoulders, basically restricting me to upper-body shots from a single angle and position. Being 2pm, the light was also quite harsh, and the angle the light was coming from meant that the performers' faces were mostly in shadow, while things like white feathers would blow out very easily. And I'm not particularly fond of the shops etc. as the background either. I was shooting with the Nikon 70-300mm/4.5-5.6 VR lens, so I couldn't really open up the aperture to defocus the background more. 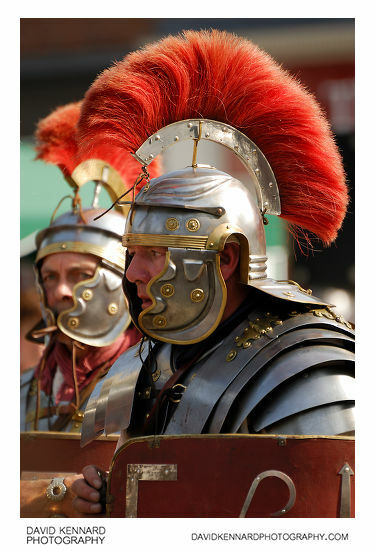 Regarding the actual display, I thought it was very good, the guys must have been quite hot in their full Roman armour as it was T-shirt weather. 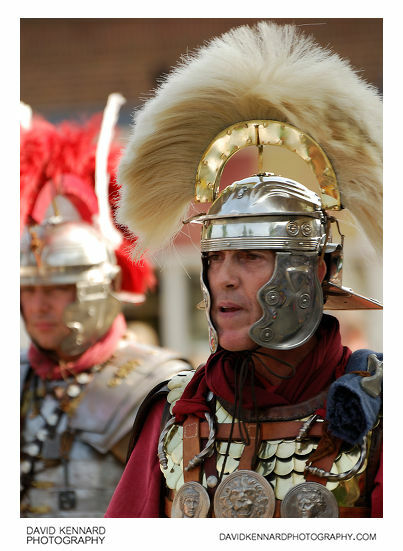 I found it quite difficult to hear the Centurion, who was explaining various things to do with the Roman army. Really he needed a microphone. HFM were there with a PA system, so I'm not sure why the performers couldn't have used this - maybe they only had a wired mike, and the lead was too short?